Mental Health and More...: Business and Mental Health...Do They Coexist and Can They? Business and Mental Health...Do They Coexist and Can They? Over the past few years, I have worked for several business owners who were clinicians and even fewer who were not clinicians. It is understandable that a business must focus on the "bottom line" in order to maintain itself. I have seen poor marketing result in a decline of client flow, which then resulted in budget cuts, lay-offs, or loss of benefits. I have seen bosses who consider penny pinching the only way to run a business and it affect the clients and the workers, thus affecting the environment. I have yet to see a healthy balance of employee and client-focused business practice that creates an environment of trust and safety for all involved. I find it ironic that the mental health industry focuses heavily on aiding the individual, family, and society to learn how to maintain a sense of interpersonal and intra-personal safety, and yet the business practices may not match. I'm not saying this as a global problem and I'm not trying to overgeneralize. Simply put, my experiences are on the negative end and I am curious if business practices can match person-centered styles that we as clinicians attempt with our clients? My belief is yes. I have recently been reading a book called "How To Be Like Walt" by Pat Williams. 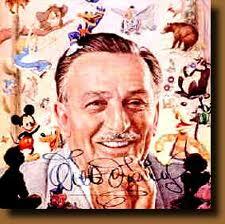 There are many books about Walt Disney, his life, his profession, his personality, and his follies. I am enjoying this one, because it appears to embody the American Dream that Walt Disney attempted to live. It certainly does not say that he was by any means a saint. Appropriately, the book reviews his personality and behavioral flaws that negatively affected his employees and relationships. On the other hand, it reviews the story of a man with a dream to provide entertainment with a high level of excellence and to keep pushing the limits of the field of animation and family-oriented entertainment. It is interesting that he was willing to sacrifice so much of his own personal comfort to, at times, pay his staff more than he was making. His brother, Roy, would focus on the books and the "bottom line," but Walt pushed those limits to make his dreams come true. There were many failures. I appreciate reading about those. However, it appears in the end that he was very person-focused and person-oriented and sacrificed his own bottom line. Again, I am not endorsing him or his business models as the be-all end-all; just simply one example of many that demonstrates that the bottom line is important, but it does not have to be what drives a business. In mental health, there needs to be a similar approach. Seek for excellence as a clinician or clinical practice with the desire to be better for the sake of being better, all while attempting to be client and employee-focused even at the expense of the owner's pocket. This can create a sense of unity and appreciation for all employees involved and then the client-care quality can increase.